The Jets’ offensive coordinator for one season, John Morton will return to an NFL sideline after missing the 2018 season. The Raiders announced they hired him as a senior offensive assistant. Morton will find his way to a Jon Gruden‘s staff. While Gruden and Morton have not worked together as coaches, they have been in the same organization multiple times. Gruden was a young Packers wide receivers coach for two seasons in the 1990s. An NFL receiver hopeful, Morton spent time on Green Bay’s practice squad in 1993. Gruden also paved the way for Morton’s post-playing career in the league, giving him a job as a Raiders executive in the late ’90s. Morton, 49, joins Kirby Wilson and Taver Johnson as new Raiders hires. Wilson also has a history with Gruden, serving as running backs coach for his first two Buccaneers teams. Wilson has since coached running backs with five other teams. In total, the 57-year-old assistant has now been on an NFL staff as running backs coach for nine NFL franchises since 1997. His most recent gig turned out to be a one-year role, serving on one-and-done Cardinals coach Steve Wilks‘ staff. The Raiders will bring Johnson back to the NFL after a 15-year hiatus. Set to become the Raiders’ assistant defensive backs coach, Johnson has been a college assistant since 2005, rising to positions of Miami (Ohio) and Temple DC. In 2018, Johnson coached Ohio State’s cornerbacks. He was a Browns assistant in 2004. Morton, whose lone Jets offense ranked 28th in total yardage, clashed with Jets coach Todd Bowles and had issues with some Jets coaches. He will have a chance to rebuild his coaching reputation with a rebuilding team. John Morton and Jim Harbaugh worked together during the best stretch of 21st-century 49ers football, with Morton coaching San Francisco’s wide receivers from 2011-14. That duo could link up again in Ann Arbor. Michigan is interested in the one-and-done Jets OC to coach its wideouts, Bruce Feldman of SI.com reports. Former Florida head coach Jim McElwain is also in the running for this job, Feldman reports, noting the ex-Gators leader interviewed recently. Morton spent one year as an NFL OC but has experience on the college level, having overseen the 2009 and ’10 USC offenses. He coached the Trojans’ WRs in the two years prior. Morton spent the past seven seasons in the NFL. The Jets fired Morton last month. Here’s the latest from the coaching ranks, now that every NFL team has a head coach again. Frank Reich has been contacting coaches about joining his first Colts staff over the past few days, Albert Breer of SI.com tweets, and former Lions defensive backs coach (and ex-Vikings DC) Alan Williams is a candidate to join Reich in Indianapolis. If hired, Williams would be returning to Indianapolis, along with Reich. Williams served as Colts DBs coach throughout the Tony Dungy and Jim Caldwell tenures, which spanned 10 years from 2002-11. Reich was on Caldwell’s three Colts staffs. Matt Patricia did not retain any Lions defensive coaches upon taking the job in Detroit. A defensive line coach for four NFL teams between 2004 and 2015, Karl Dunbar will join a fifth staff in that capacity. The Steelers hired Dunbar after he’d spent the past two seasons coaching at Alabama. He’ll head up the Pittsburgh D-line and rejoin forces with Mike Tomlin. Dunbar served under Tomlin for one season with the Vikings (2006) before the defensive assistant took the top coaching job in Pittsburgh. Dunbar, who coached in Minnesota for six years, also was an eighth-round Steelers pick in 1990. John Mitchell served as Pittsburgh’s defensive line coach from 1994-2017. The longtime Steelers assistant will remain on staff and retain his assistant head coach title next season. The Steelers also promoted Shaun Sarrett to assistant offensive line coach, Mark Kaboly of The Athletic tweets. Sarrett has worked with Steelers blockers since 2012. Ricky Manning Jr. will not return for a third season with the Seahawks, Curtis Crabtree of Pro Football Talk tweets. The former NFL cornerback had been the teams’ assistant defensive backs coach the past two seasons. John Morton‘s firing may have come as a surprise to many, especially given that the Jets’ 2017 offense performed much better under Morton than most could have hoped. However, there may have been more to the dismissal, as Connor Hughes of NJ.com reports Morton and New York head coach Todd Bowles “clashed” throughout the season. 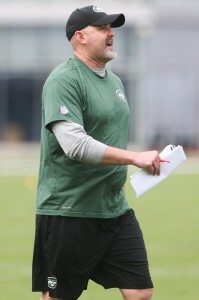 Per Hughes, Bowles often made suggestions to Morton that were ignored, while other assistants on the Jets’ staff also took issue with Morton’s style. Meanwhile, Lions quarterbacks coach Brian Callahan could emerge as a candidate to replace Morton, as the Jets wanted to hire Callahan a year ago, per Jason La Canfora of CBSSports.com (Twitter link), adding that Callahan has garnered offensive coordinator interest in each of the past two offseasons. Jarvis Landry says that while he and the Dolphins have exchanged contract figures, the negotiations between the two sides have been “disrespectful,” as Barry Jackson of the Miami Herald writes. Per Landry, the Dolphins made an extension offer in December, but haven’t responded to a counteroffer made by the slot receiver and his agent. It’s possible that Landry is seeking a Davante Adams-esque contract, which could mean a $14MM annual salary and more than $30MM in guarantees. Earlier today, Armando Salguero of the Miami Herald outlined several of the Dolphins’ concerns regarding talks with Landry. The Dolphins have hired former Lions defensive line coach Kris Kocurek for the same position in South Beach, reports Dave Birkett of the Detroit Free Press. In Miami, Kocurek will not only reunite with star defensive tackle Ndamukong Suh, but defensive coordinator Matt Burke, who worked with Kocurek in Detroit from 2009-13. Kocurek, whose possible defection to Miami was first reported by Albert Breer of TheMMQB.com, will replace ex-Dolphins DL coach Terrell Williams, whose contract was not renewed. The Lions have now lost several assistants from the defensive side of the ball, including coordinator Teryl Austin, who took the same role with the Bengals. Running back Rex Burkhead will be available when the Patriots face the Jaguars in Sunday’s AFC Championship Game, according to Ian Rapoport of NFL.com (Twitter link). While Burkhead hasn’t been on the field since mid-December while dealing with a knee injury, he was apparently “close” to suiting up when New England faced Tennessee in the Divisional Round. Burkhead managed 264 yards rushing and 254 yards receiving during the regular season, but those numbers belie the fact that his role grew as the season progressed. John Morton is out as offensive coordinator of the Jets, according to Manish Mehta of the Daily News (on Twitter). The Jets were hoping that Morton would be hired away by another team, but that never happened. Instead, the well-liked Morton has been pushed out. Under Morton’s watch, the Jets finished 28th in total yards, 19th in rushing yards, and 24th in both scoring and passing yards. Overall, however, the Jets’ offense performed better than most expected. Quarterbacks coach Jeremy Bates is a strong candidate to take over his job, but nothing has been finalized just yet. Former Steelers offensive coordinator Todd Haley could also be a candidate for the position, according to ESPN.com’s Adam Schefter (on Twitter). It has been rumored that Bates is the Jets’ preferred choice for the OC job, but he has indicated to the team that he is not interested in the position. It’s possible that Bates could have a change of heart if the Jets are willing to pay him more than the average OC. Another name to keep an eye on is Eagles quarterbacks coach John DeFilippo. DeFilippo was the Jets’ top choice to replace Chan Gailey last year before Philly blocked the interview request, according to an earlier report from Mehta. However, DeFilippo could be in play for a head coaching position this offseason and figures to have several other offensive coordinator opportunities. Offensive coordinator John Morton is not a lock to return to the Jets in 2018, as Manish Mehta of the Daily News details. The Jets will not stand in the way if Morton is offered an opportunity to join up with the Raiders. Meanwhile, some within the organization would like to see quarterbacks coach Jeremy Bates elevated to OC. Morton is well-regarded in New Jersey, but the results have been underwhelming. This past season, the Jets finished 28th in total yards, 29th in first downs, 24th in passing yards, and 19th in rushing yards. Granted, he wasn’t exactly working with the most talented personnel out there. If the Jets do nudge Morton out the door, it’s not a given that Bates will want to ascend to OC. In fact, just a couple of weeks ago, Bates indicated that he is not interested in taking the job. Given Todd Bowles‘ desire for consistency, the team’s best bet may be to stick with Morton if Bates is unwilling to move up the ranks. Though he has not officially taken the job, Jon Gruden is expected to become the next head coach of the Oakland Raiders, ESPN’s Adam Schefter reported Sunday night. “The more you talked to people, the more they were convinced Jon would reenter coaching this year,” Schefter said. The return to coaching would be Gruden’s first job on the sideline since he left Tampa Bay in 2008. The Super Bowl XXXVII-winning coach broke into the league with the Raiders in 1998 at the age of 35 and amassed a 38-26 record in four seasons with the team. Despite the rumors, ESPN has said that Gruden will call Saturday night’s playoff game with the Monday Night Football crew. That, of course, is likely to change should the announcement be finalized. News broke Sunday night that Jets offensive coordinator John Morton was expected to be a target for Gruden’s coaching staff. On Monday, the Jets are expected to let Morton out of his contract to join Gruden in Oakland, the New York Daily News’ Manish Mehta hears (Twitter link). ESPN’s Adam Schefter reported (Twitter link) that Bengals defensive coordinator Paul Guenther is expected to be pursued by Gruden for the same role in Oakland. Guenther’s contract expired following the Bengals’ 31-27 win over the Ravens on Sunday. If Marvin Lewis is not retained in Cincinnati, however, Guenther could be a candidate for the head-coaching gig. On Monday, NFL.com’s Ian Rapoport reported (Twitter link) that Gruden is expected to eventually say yes to the job after the team complies with the Rooney Rule. He also notes that Gruden is planning to call plays. Jon Gruden Interested In Hiring Jets OC John Morton With Raiders? Jon Gruden has not officially committed to leaving the broadcast booth yet, but should he do so and rejoin the Raiders, he may have a name in mind for offensive coordinator. 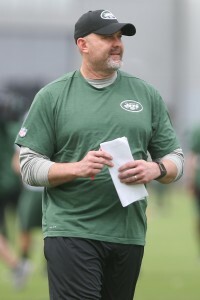 Gruden is interested in bringing Jets OC John Morton with him to Oakland for the OC role, Manish Mehta of the New York Daily News reports. The Jets would not stand in the way if that were to happen, Mehta adds. Morton broke into coaching during Gruden’s Raiders regime. Mehta notes the 48-year-old Morton considers Gruden, 54, a mentor. Morton has one year of offensive coordinator experience, signing on with the Jets earlier this year after being a wide receivers coach with the 49ers and Saints since 2011. Morton also resided on the Packers’ practice squad briefly during Gruden’s time as a Green Bay assistant in the early 1990s. This season, Morton helped coax quality play from Josh McCown. The 38-year-old passer set a new career high with 18 touchdown passes. He completed 67 percent of his passes despite working with a young offense, this coming after McCown connected on just 55 percent of his throws with the 2016 Browns. Robby Anderson also enjoyed a breakout year under Morton, recording 941 receiving yards, with Jermaine Kearse also having his most productive season as a pro. Although the Jets entered Week 17 with the league’s 24th-ranked offense, they were not supposed to be as productive as they were, and Morton may have a believer in Gruden. The Jets officially announced that they are hiring former Saints wide receivers coach John Morton as their new offensive coordinator. He’ll take over the post vacated by veteran coach Chan Gailey. 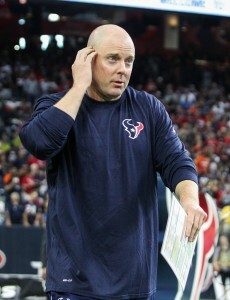 Morton and former Texans OC George Godsey were the two finalists for this position, and although Godsey offered OC experience, Morton was coming off a banner year coaching New Orleans’ receivers. The Saints led the NFL in total offense and generated constant production from their wideouts, including UDFA Willie Snead and rookie Michael Thomas. Morton’s past with Sean Payton, willingness to use the West Coast offense, and plans to fully utilize the tight end position caught Todd Bowles‘ attention, Rich Cimini of ESPN.com tweets. Jets tight ends under Gailey produced historically unproductive numbers with just 26 receptions combined during his tenure. Meanwhile, Bowles is expected to be more involved with the offense in 2017 than he was in the previous two seasons. At one point, the Jets were potentially leaning toward Godsey, having done “extensive homework” on the former Texans assistant. The Jets also considered eventual Broncos OC Mike McCoy and interviewed current McCoy staffer Eric Studesville before the Denver running backs coach withdrew from consideration. The Eagles put the kibosh on a Jets meeting with quarterbacks coach John DeFilippo as well. Morton served as OC at USC from 2009-11, but has no prior play-calling experience in the NFL. The Jets’ decision to hire Todd Bowles as their head coach instead of Dan Quinn in 2015 may have cost them a chance to acquire then-backup quarterback Kirk Cousins from the Redskins, according to Manish Mehta of the New York Daily News. Quinn’s offensive coordinator in Atlanta, Kyle Shanahan, would have come with him to New York but would not have wanted to work with Geno Smith, sources told Mehta. Shanahan would have pushed to acquire Cousins, whom he knew from their time together in Washington in 2012. A big Cousins fan, Shanahan was reportedly “integral” in the Redskins’ drafting of the ex-Michigan State signal-caller. Along with Shanahan, Quinn would have brought former Buccaneers general manager Mark Dominik with him to work in the Jets’ front office. Dominik is close with Redskins president Bruce Allen, and their friendship could have further helped lead the way to a Cousins trade, writes Mehta. While Steelers quarterback Ben Roethlisberger is considering retirement, it will be a surprise if the 13th-year man doesn’t return in 2017, sources told Jeremy Fowler of ESPN.com (Twitter link). In the seemingly likely event Roethlisberger does come back for his age-35 season, the Steelers should still give serious thought to using a high-round pick on a potential successor, opines Mike Florio of Pro Football Talk. The Jets’ previously reported interest in Saints wide receivers coach John Morton has already led to an interview. The two sides met Tuesday, and Morton remains in the running for the job, reports Mike Triplett of ESPN.com. It appeared the NFL had lifted running back Karlos Williams‘ 10-game suspension when the Steelers brought him back on a reserve/futures deal Monday, but that’s not the case. Williams still has one game remaining on the substance abuse-related ban the league handed him in November, tweets Fowler. He’ll be eligible to take the field again in Week 2 of next season. The belief is that the Bengals are talking to pending free agent kicker Randy Bullock about a new contract, writes Geoff Hobson of the team’s website. Re-signing Bullock wouldn’t stop the Bengals from searching for other options at the position, notes Hobson. The 27-year-old Bullock didn’t join the Bengals until mid-December, when they claimed him off waivers from division-rival Pittsburgh after releasing Mike Nugent. Bullock, who was a member of three teams in 2016 (the Giants were the other), connected on 5 of 6 field goal tries and all six extra points in three games with Cincinnati. The Broncos made a minor change to their Vance Joseph-led staff Tuesday, promoting special teams quality control coach Chris Gould to assistant special teams coach. They’re also set to retain Klint Kubiak, the son of previous Broncos head coach Gary Kubiak, as their offensive assistant/quarterbacks coach, per Nicki Jhabvala of the Denver Post. Just over a week after he and the Texans parted ways, offensive coordinator George Godsey is drawing interest from the Jets, reports Rich Cimini of ESPN.com. New York, which is looking for a successor to retired O-coordinator Chan Gailey, could interview Godsey at the Senior Bowl as early as Tuesday, per Cimini. 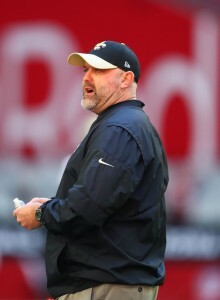 The club also has Saints wide receivers coach John Morton on its radar. It has been exactly three weeks since the embattled Gailey stepped down, but the Jets haven’t made much progress in finding a replacement. They previously targeted Mike McCoy, but he took Denver’s coordinator job, as well as Eagles quarterbacks coach John DeFilippo and Broncos running backs Eric Studesville. Those two aren’t leaving their current organizations, however, and the same seems likely for another coach the Jets have eyed, Chiefs co-OC Matt Nagy. Godsey, meanwhile, is looking for work and would bring two years’ experience as a coordinator to the Jets. The 38-year-old had little to work with under center in Houston, whose offense struggled on his watch, and lost play-calling duties last September to head coach Bill O’Brien. As he did with the Texans, Godsey would have to deal with a less-than-ideal quarterback situation if he were to end up with the Jets. The team’s only options heading into the offseason are Christian Hackenberg and Bryce Petty. That means the Jets will have to hit the jackpot on a signal-caller either through free agency or the draft, in which they’ll pick sixth. Unlike Godsey, Morton has no play-calling experience at the NFL level, but he was USC’s offensive coordinator under Pete Carroll in 2009 and Lane Kiffin from 2010-11. He then jumped to the pros, where he has coached wideouts with the 49ers and Saints over the past six seasons. Under Morton’s stewardship in 2016, the Saints had three receivers finish with at least 70 catches and 895 yards. One of those players, Michael Thomas, piled up 92 receptions, 1,137 yards and nine touchdowns as a second-round rookie.